Taulman 3D 618 3mm nylon is a flexible, durable co-polymer specifically designed for 3D printers. It has excellent adhesion to the printing plate and increased resistance to humidity. 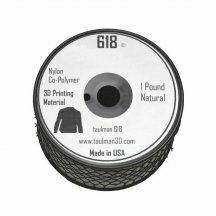 This spool contains 450g of Taulman 3D 618 3mm nylon filament. Made in the USA, the 3D print finish of 618 nylon is white and slightly translucent on the surface. The flexibility and elasticity of 618 nylon make your prints flexible while remaining resistant to breaking or tearing. You can relax and stretch your printed object.